Are you craving for traditional Japanese food? Yep, it is really hard to refuse yourself such a treat. What can stand on your way to eating yummy meal? That’s right, you will have to wait before the dish is cooked. But what if we say that you can eat your favourite prize course right now? 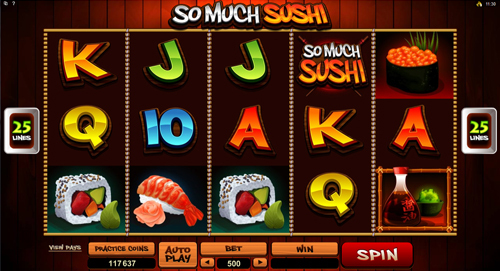 Enter So Much Slot Machine via no download version and you will make sure that it is simplicity itself. California Roll, Red Clam, Ikura Gunkan, Amaebi, Carterpillar are served on 5 reels and 25 lines. And all these symbols are savoured with Soy Sauce and Wasabi. Microgaming team did its best to represent all rolls that would befit your taste. Cliff notes 😉 Nobody is watching, grasp the appetizing awards and still your hunger. You have probably had your seafood preference, but we urge you to try the wild dish. This roll is made of money prizes and has a name So Much Sushi Logo. Once you have tried it, you won’t give up the pleasure and gratification of it for anything in the world. As you know, all these roll symbols won’t taste good without the scatter. Add 3, 4 or 5 Soy Sauce and Wasabi icons to give a relish to your prize by 3, 10 or up to 75 times. 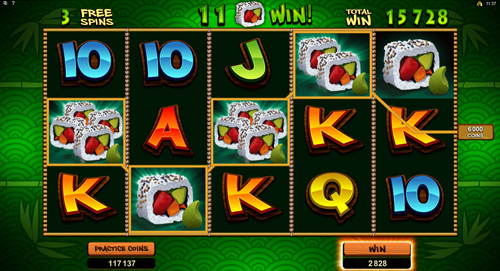 You have never tasted such mouthwatering jackpots. So what do you think? Is it a high time to experience a new Asian dish? Play Dragon Lady Slot Machine to get acquainted with representative of the culture to win more prizes. 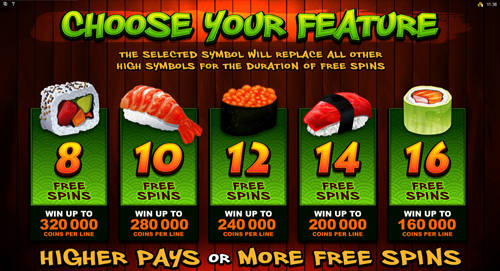 After dinner comes the reckoning, but the slot offers you to pay the bill before eating sushi symbols. Thus, you won’t feel amazement at the score as you can allot your money beforehand. There are various coin sizes that range from $0.01 up to $1.00. If you want, you can put up to 20 coins per line. Apparently that your bill won’t go over the max sum for a bet of $500. Who pays the piper calls the tune. That’s why players, who can afford yourself to make $500 away, will get the welcome top jackpot from Microgaming chief cook. Well, you can manage 5 California Rolls, but what about 25 such delicious symbols? Split Up Feature that can award you with up 25 winning icons will churn out the precious rolls for you. 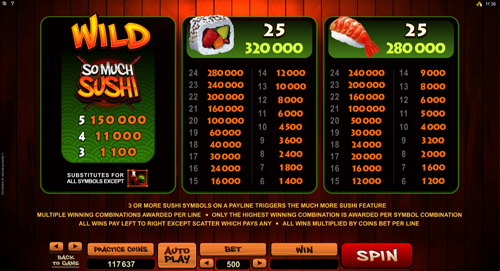 Quench the top jackpot thirst with 320,000 coins or $320,000, but after you have swallowed all 25 California Rolls only. 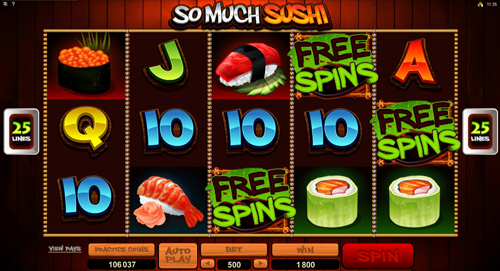 Taste the sweets of So Much Sushi Slot Machine and win up to $320,000 during California Roll Sushi course. Are you ready to swallow prizes in run? 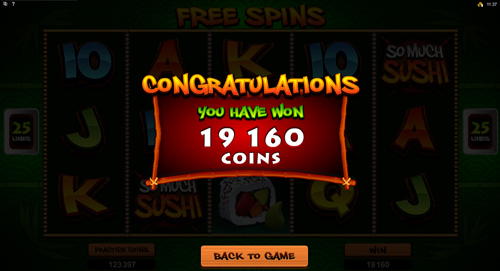 You will be given 8 Free Spins to chew over the cash meals.